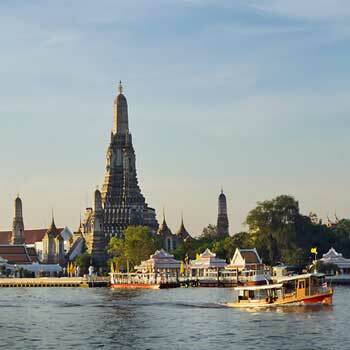 Across the river from Wat Po is Wat Arun, or the Temple of the Dawn, one of the ciy's most important and beguiling religious sites. Before replacing to Wat Phra Kaew, the Emerald Buddha was temporarily housed here. The five-towered structure is covered almost entirely in pieces of colourful porcelain and designed as a representation of Mount Mehru, the Khmer home of the gods. The temple is believed to have been named by Rama 1 on his first sunrise visit, but in contrast with its name, it is best visited at dusk when the setting sun forms a stunning backdrop.